I love history. I love historical fiction. When I first saw All The Light We Cannot See, I was very intrigued but also a little afraid. I wanted to love this book so much, but I wasn’t entirely sure how it would play out. Especially since one of the main characters is a blind girl; would her story come across on the page? I picked up the book anyway. I wanted to absorb this story, I wanted to read about these people. The first couple of pages took me a bit to get through. After all, they were setting the stage for the wondrous, rich prose that would follow. And pretty much from the 10th page in, I was hooked. And I couldn’t put it down. If I was hesitant reading a story from the point of view of a blind girl, I should not have been. Anthony Doerr does a magnificent job at explaining exactly what is going on around Marie-Laure with all of the other senses she possesses. It’s like I was in her head experiencing everything she was experiencing, but I was also outside of her and able to see what she could not. It was wonderful, it was beautiful, and it made Marie-Laure my favourite character. I was tense the entire story, waiting for something bad to happen to her, hoping it wouldn’t, and afraid if it did. Werner was a little harder for me to fall in love with, but I did. It was hard following him through his story with all the hardships that are put in front of him, and watching him as a little boy and young man make the best decisions he can. It’s interesting to see this part of history from his point of view. The simple hobby of fixing radios gets him a spot in Hitler Youth, and propels him forward on this insane path during the war. The assurance and innocence of a young boy turn into the questioning nature of a young man, and you get to watch it all unfold. Now, what’s interesting for me was how insignificant the mention of the radio is. You think “oh it’s just a radio, just another piece of technology.” But this simple piece of machinery has such a powerful impact on the plot, and I loved the way it ended up tying the story lines together. After all, a simple thread can unravel an entire sweater (that’s a saying, right?). If you love historical fiction, read this book. If you love getting emotionally invested in characters, read this book. If you love to read, read this book! In the late seventeenth century two penniless young Frenchmen, René Sel and Charles Duquet, arrive in New France. Bound to a feudal lord, a “seigneur,” for three years in exchange for land, they become wood-cutters—barkskins. René suffers extraordinary hardship, oppressed by the forest he is charged with clearing. He is forced to marry a Mi’kmaw woman and their descendants live trapped between two inimical cultures. But Duquet, crafty and ruthless, runs away from the seigneur, becomes a fur trader, then sets up a timber business. Proulx tells the stories of the descendants of Sel and Duquet over three hundred years—their travels across North America, to Europe, China, and New Zealand, under stunningly brutal conditions—the revenge of rivals, accidents, pestilence, Indian attacks, and cultural annihilation. Over and over again, they seize what they can of a presumed infinite resource, leaving the modern-day characters face to face with possible ecological collapse. I received this book from the publisher in exchange for an honest review. This in no way altered my opinion of it. Cross my heart. It sat, monstrously, on my shelf, staring at me for a month and a half before I decided to try and tackle it. I’m still on the fence about whether I enjoyed it or not. I mean I did, but to a degree. It was incredibly interesting to see the story unfold, generation to generation. I love hearing about people’s history, and Barkskins definitely reached that deep down love for me. Each character was wonderful in his or her own way, and they were all very distinct. It felt like I was actually watching history unfold instead of reading a novel about it. It was cool to see the history of family as well as a more broad history at the same time. The writing, mmm! I’ve never read anything else by Annie Proulx, but I might have to go check out her other novels now. Her writing is wonderful. The entire novel was rich with detail. I don’t even have proper words to explain how much I loved her writing. I liked that since the beginning of the story takes place in New France, she included some French in the dialogue, but worked in the explanations afterwards. My Grade 9 French is pretty rusty but I was still able to understand what was going on. The downside to this rich writing, and why I’m not entirely sure if I enjoyed the novel or not, is because it was laborious. It takes away from the story if I’m constantly having to push myself to read a book. I normally don’t have an issue reading long books, but because it’s based more on details and less on action (the action I prefer at least), it dragged for me. I had to pay attention to so much detail, so many different characters (there are family trees in the back which are helpful some of the time), that my brain started to hurt. I didn’t know what was going to be important for later on or what wasn’t. I struggled hard, but I also enjoyed the story, so I DON’T KNOW. My only suggestion is that if you like history and have the time to read details, pick up this book. If you’re looking for some fast paced light reading, maybe this isn’t the book you should be looking at. It’s definitely one of those novels you have to be in the mood for, but when the moods right, it’s fantastic. If only she can find the heir, maybe she can put together the broken pieces of her own past - maybe she can hold on to the love she found. 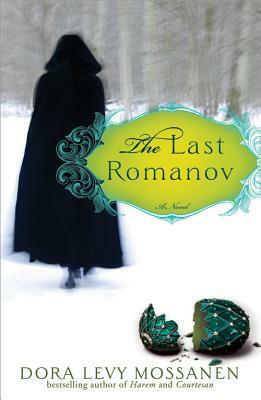 Bursting to life with the rich and glorious marvels of Imperial Russia, The Last Romanov is a magical tale of second chances and royal blood. I picked this book up simply because it had the name ‘Romanov’ in it. I’m not even kidding. I didn’t even read the back of the book to figure out what it was about, I just bought it. I love reading about history and different spins on history, and what happened to the Romanov family is well known. The book was a tad bit disappointing. The writing was a little slow, and not much of the mystery that happens in the book is explained. I was expecting the book to revolve what happened to the Romanov family, or the events surrounding their deaths, but it didn’t really. The book took me a long time to get through because it never really grabbed my attention. Unfortunate because I really wanted to love this book.